NJ Labor Commissioner Robert Asaro-Angelo spoke to business leaders at Meet the Decision Makers event in Monroe Township on Sept. 28. The event was sponsored by NJBIA and the NJ State Chamber of Commerce. 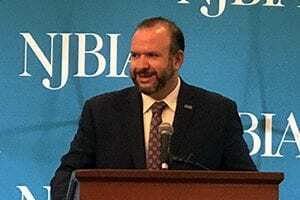 New Jersey’s new Apprenticeship Network is laying the groundwork for a historic expansion of apprenticeship opportunities that will benefit workers and employers alike, State Department of Labor & Workforce Development Commissioner Robert Asaro-Angelo told business leaders Friday. Speaking at a Meet the Decision Makers event hosted by NJBIA and New Jersey State Chamber of Commerce, Asaro-Angelo said the New Jersey Apprenticeship Network (NJAN) program will support traditional apprenticeships, as well as new initiatives in high-growth sectors. The state’s $10 million investment in NJAN is being used to establish apprenticeship opportunities in other in-demand industry sectors in New Jersey, such as hospitality, advanced manufacturing, construction and utilities, healthcare, life sciences and so much more, Asaro-Angelo said. “In my mind, there is almost no sector in which apprenticeship can’t be used to build and train tomorrow’s workforce,” Asaro-Angelo said. The state’s Talent Networks and Talent Development Centers are laying a strong foundation for this initiative by matching the unique needs of New Jersey’s major industry sectors with higher education curriculum, regional demographics and needs identified by workforce development boards, he said. The commissioner encouraged the business leaders interested in partnering with NJAN to find out more about the initiative online at www.nj.gov/apprenticeships. I hope so. I have tried working with the NJ Dept. of Labor and it took lots of time and never worked.